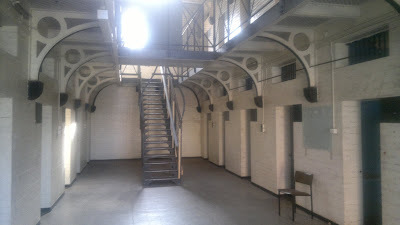 Current-day "F Wing"...the only cell block accessible at the gaol. For those who are aware that Boggo Road Gaol has re-opened under the commercial management of Cameron "Jack" Sim, you're likely asking yourself, "Why the hell did a Government Department give overriding management access, inside a publicly-owned historic site, to a small-time commercial ghost tour operator??" Well...before you jump to the conclusion that Ghost Tours Pty Ltd were issued with a Deed of License to access the site (which you couldn't be criticised for thinking, given that Cameron "Jack" Sim hasn't even remotely attempted to clarify his business dealings), the Deed of License was issued to the independent company Boggo Road Gaol Pty Ltd - ironically also owned by Cameron "Jack" Sim, & staffed by the same motley crew as Ghost Tours Pty Ltd! We're informed straight away that Boggo Road Gaol "hasn't been open to the public in 8 years" - in actual fact, regardless of multiple public statements by Cameron "Jack" Sim in recent weeks, Boggo Road Gaol closed its doors in December 2005, 7 years almost to the day! Next, we're told that Cameron "Jack" Sim started taking tours at the gaol almost 15 years ago - in actual fact, Cameron Owen Sim registered his new ghost tour business on the 5th of June 1998 (14 ½ years ago), started running basic walking tours through the CBD of Brisbane around August/September 1998, & finally gained access for tours at Boggo Road Gaol in early 1999 (just under 14 years ago) - amusingly, Mr Sim claims in the introduction to his book The Ghosts of Boggo Road Gaol: Ghosts & Gallows, "In January 1998 I tentatively walked up to the imposing gates of Number Two Division - the only section still standing of Boggo Road Gaol. I rapped on the gate, as visitors to this section of the prison had for over ninety years. I was greeted by a man with a thick Yorkshire accent who introduced himself as the curator of the Boggo Road Gaol Museum. [W]e sat down at a table and he asked me did I have my insurance as requested over the phone, 'Yes', I replied, 'would you like to see it?'. 'No', he said, 'we have a gentleman's agreement'. With that he handed me a large ring with a huge set of keys to the front gates of Boggo Road Gaol." So...apparently, 6 months prior to Cameron Sim registering his new business (& organising his associated public liability insurance), he dropped by Boggo Road Gaol & secured a set of keys from the then proprietor Don Walters under false pretences/fraudulent business practice...or so he'd have us think! Skipping Steve Gage's response to some of the major concerns regarding the commercial focus now placed on the gaol, we hit the first major issue of the article...whereby we're told by the reporter that "the decision to open the gaol under the private model, was made by then Public Works Minister Bruce Flegg" - after five weeks of fruitless meetings with Department of Housing & Public Works staff, a meeting was finally organised with the prior DHPW Minister, Dr. Bruce Flegg, at close of business on the 13th of November...during this meeting, Dr. Flegg made repeated mention of his enthusiasm for ongoing broad public access at Boggo Road Gaol. Unfortunately, Dr. Flegg posted his resignation less than 24 hours later, during the day's Parliamentary sitting on the 14th of November...yet we're expected to believe that the outgoing Minister passed a decision to grant Cameron Sim a Deed of License over Boggo Road Gaol, in his final hours?? Sadly, in the three weeks proceeding Bruce Flegg's resignation, the Boggo Road Gaol Historical Society made repeated enquiries, as did I, regarding the opening of Boggo Road Gaol, as we'd been told the Government planned to open the site on the 1st of December - when the 1st of December came & went, a further meeting was scheduled for the 5th of December to provide the BRGHS with "an update on how the plans for the gaol were progressing." During that meeting, the shock announcement was made that a Deed of License had been issued to Sim, & the gaol would be opening in a couple of days...imagine our added surprise when we arrived home to discover on the Courier Mail website that the DHPW Minister, Tim Mander, had officially opened the site that morning - at the very same time our meeting had been taking place with DHPW Officials! "Jack" fails the facts again. All content on the Haunts of Brisbane site is copyright. Apart from any fair dealing for the purpose of private study, research, criticism or review, as permitted under the Copyright Act, no part may be reproduced by any means or process without the written permission of the author. © Liam Baker 2011-2017. Welcome all. The purpose of this blog is not to irrefutably prove the existence of Brisbane's ghosts - it is an attempt to uncover and correct the heavily fabricated history, peddled as 'truth' for the past decade, behind the tales themselves. For many years I have worked as a consultant archaeologist, an historian, a genealogist and an author - historic research is my field of expertise, and I pride myself on conducting this with integrity and accuracy.